Penguins make cute inflatable outdoor Christmas decorations, but penguins deflate the theory of evolution. Evolution is the gift that keeps on giving. Every month the professional scientific literature gives us something to write about. The first sentence of a recent article in Science caught our attention. Let’s translate that into plain English. Their analysis is based on some cells called melanosomes. They found some feather fragments and looked at these cells under an electron microscope to measure their shape and size. Modern penguins have melanosomes about 900 nanometers long and 440 nanometers wide, but other birds have smaller ones (about 300 nanometers). 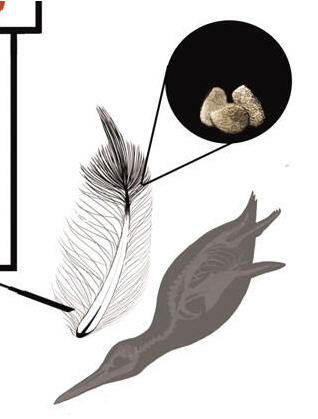 These fossilized melanosomes were small, making them much closer to other kinds of birds than penguins. Based on the size and shape of these cells, they tried to estimate what color the extinct penguin feathers would have been. They concluded that the feathers would have been gray or reddish-brown, unlike modern penguins. This sounds very impressive, but a picture is worth a thousand words. Their Figure 4 shows their postulated evolutionary tree. You can’t really see what you need to see in the drawing at that scale. What they did was to compare the cells in the two black circles (enlarged below) and then drew some conclusions. Here are the conclusions they drew. In plain English, they think these cells MAY have changed size and shape because of climate change or to avoid predators (despite the fact that it doesn’t really explain the brown-black color of modern penguins). But MAYBE the changes in color are somehow related to swimming in water rather than flying. That’s because the color MAY be a byproduct of the feather’s other properties, such as density and stiffness, which MAY have evolved to improve the ability to swim. These nine authors deserve a great deal of credit for being able to get a three-page article with such a pretentious title (“Fossil Evidence for Evolution of the Shape and Color of Penguin Feathers”) published in a prestigious journal with so little actual evidence. One can only conclude that the authors are either very smart or very stupid. Deep avian evolutionary relationships have been difficult to resolve as a result of a putative explosive radiation. Our study examined ~32 kilobases of aligned nuclear DNA sequences from 19 independent loci for 169 species, representing all major extant groups, and recovered a robust phylogeny from a genome-wide signal supported by multiple analytical methods. We documented well-supported, previously unrecognized interordinal relationships (such as a sister relationship between passerines and parrots) and corroborated previously contentious groupings (such as flamingos and grebes). Our conclusions challenge current classifications and alter our understanding of trait evolution; for example, some diurnal birds evolved from nocturnal ancestors. Our results provide a valuable resource for phylogenetic and comparative studies in birds. Although well studied, the evolutionary relationships among major avian groups are contentious. Recovering deep evolutionary relationships in birds is difficult, probably reflecting a rapid divergence early in their evolutionary history that has resulted in many distinctive, morphologically cohesive groups (e.g., owls, parrots, and doves) with few, if any, extant intermediary forms linking them to other well-defined groups. 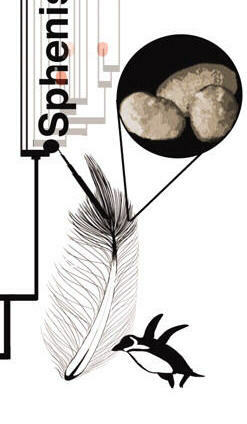 This extreme radiation also makes it difficult to place fossil taxa, which further contributes to the difficulty in precisely timing avian divergences. The other important point to note is that the DNA analysis isn’t consistent with traditional classification. Back in the 20th century, this was news! Longtime readers of this newsletter will remember that we reported “The DNA Dilemma” in July of 1999 6. The scientific journals of 1998 and 1999 were filled with alarming stories about how the DNA analysis wasn’t consistent with traditional classification based on body shape and structure. This was disturbing to evolutionists because they knew that the theory of evolution depends upon the notion that the most closely related creatures should have the most closely related DNA. But, for more than a decade, study after study has shown this isn’t true. So now, when DNA analysis (“molecular phylogenetic study”) doesn’t agree with traditional classification (based on “morphological study”), it is shrugged off. In the case of birds, only two (of many) branches of the traditional evolutionary tree of birds agree with DNA analysis. It’s no big deal (but we better not confuse biology students by telling them that)! In case you aren’t familiar with the jargon, orders and phyla are classification groups. 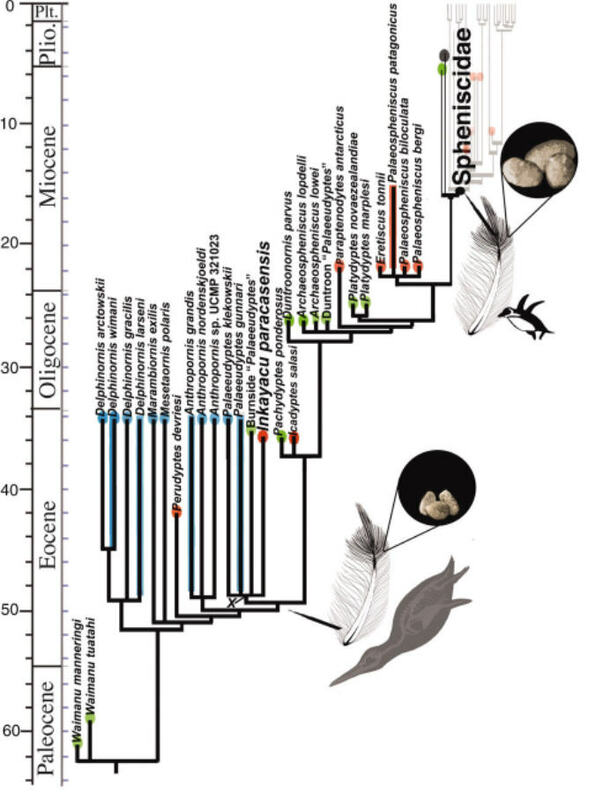 “Monophyletic” means “all in the same group.” So, one of their most important findings was that some creatures that were previously classified as being in the same biological category really belong in different biological categories. How do they explain the previous incorrect classification? They trot out their old standby—convergent evolution. They claim that unrelated species happened to evolve features similar to other unrelated species, causing them to be incorrectly classified. That is, different creatures converged on the same solution to particular survival problems. Given the number of nonmonophyletic groups in our study, we compared our results with major classifications [supporting online material (SOM) text]. Unexpectedly, roughly the same percentage (35%) of orders defined by different classifications was not monophyletic relative to the results of our study (Fig. 4). Some orders, such as Gruiformes and the broadly encompassing Ciconiiformes, were particularly problematic. Other traditional orders were not monophyletic because of the exclusion or inclusion of one or a few taxa (e.g., placing Turnix within Charadriiformes contradicts all three classifications). Only six orders were defined consistently across taxonomies and monophyletic in our study (Fig. 4). Given our results, conclusions from comparative studies that depended upon these classifications may need to be re-evaluated in light of this understanding of avian evolution. You may have seen the 2005 movie, March of the Penguins, which won the Academy Award for Best Documentary. In case you didn’t here is an excellent summary. Evolutionists have become very skillful at inventing stories that explain how behaviors evolved through natural selection. You’ve probably heard stories about how clumsy animals fell out of trees. The ones with feathers glided to the ground, so they weren’t killed. The best gliders survived and eventually learned how to fly. They think that any plausible explanation is proof of evolution. We’ve never heard any plausible explanation for the march of the penguins. Creationists can invent stories, too. They can suggest that God gives the penguins the instinct to do this to teach us a lesson about how God cares for His creatures even in the most difficult situations. Or, they might say God invented this complex mating ritual just to perplex evolutionists. No matter how convincing these stories, they must be accepted by faith. Stories aren’t science. It sounds scientific, but it’s just speculation about what might have happened. It’s not falsifiable. It isn’t based on experimental data. There’s no reason to believe that it is true, other than the authority of the person who is saying it. It is a perversion of science.